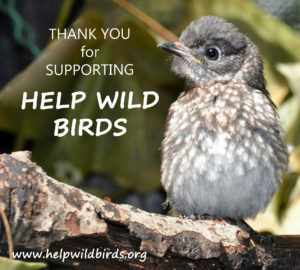 It takes a village sometimes to save and rehab birds. On June 18th two people were kayaking on the Roanoke River and saw something weird looking along the shore. They paddled over to see what it was and found a young duckling tangled in fishing line, just dangling, trapped in some branches. It also had a small fish hook in its bill which they gently removed. 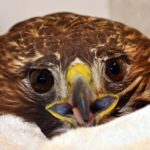 They called me and we decided that the bird should be brought to me for rehab since it was injured. I flushed the wound and other than being dehydrated a bit, the bird was in pretty good shape. Where the parent birds were no one knew. So this duck was destined to stay in rehab for a while. It was way too young to not have any parental guidance. Wood ducks are social but secretive birds. 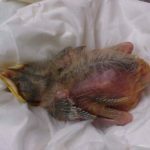 In rehab they spook very easily and can sometimes die of “fright” so one must be careful about approaching the bird for feeding and cleaning its cage. The “setup” for making a single bird comfortable involves mirrors. Lots of mirrors! That way they have a “friend” or in this duck’s case 3 mirrors so several “friends” to be with. It spent most of its time eating and talking to its friend in the mirror. A typical wood duck diet for one day is lots of chopped up greens such as kale, red romaine or a spring mix, duck chow, a ¼ cup of meal worms, and some small live crickets. They like to bath and are pretty messy so the bath water and drinking water needed to be changed twice a day. 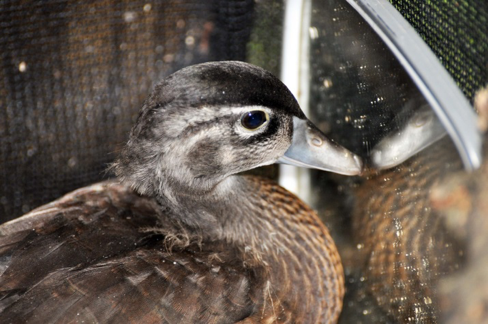 This little wood duck was with me for 7 weeks enjoying the easy life and talking to its “friends” in the mirror. A lot of food and maintenance for one little bird but that is what bird rehab involves, besides it was enjoyable watching at a distance the duckling talk to its friend(s) as it grew up. How cute is that? So the weeks pass, and the wood duck starts to grow feathers. It is looking more like a young wood duck. I now am confident it will survive. It was now time to start figuring out a game plan as to where this duck should be released. I did not want it to go back to the Roanoke River as no one knew where the parents went, plus there is so much fishing line, water pollution and people. Not the best place. 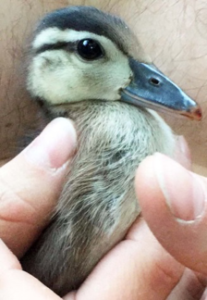 Most ducks do not need to go back to where they were found since ducks do get accepted by a new family of their own kind, unlike some other birds. 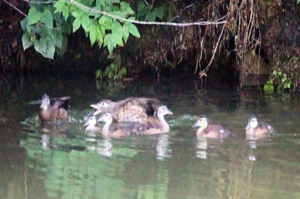 What it needed was a proper habitat and a place where it could meet other wood ducks. I asked several of our bird club members “Where do you see wood ducks” and got several possible locations. The best release place seemed to be at Carol Whiteside’s home. She has a pond with young wood ducks seen occasionally. I decided it would be released there (even though Carol did not see them all the time because they are so secretive) it was good habitat and the woodies were usually seen there when it rained. We kept in touch, waiting for release day. The best time/place to release a baby wood duck is just before it can fly and there are active wood ducks foraging. That way it stays put in the new area and cannot get spooked to fly off into the unknown. About the same time that the bird developed its short little wings, Carol called to say a mother wood duck and its family had arrived. They were on her pond, right now! I quickly packed up the bird and it was released at her pond early that day. As we were watching it waddle into the water we decided it needed it a name. Her dog was named July for its birth month. It was August and so the wood duck was named August. August was the month it gained its second chance at life and true freedom, very fitting we thought. At first the mother wood duck was a little leery about this new intruder but seemed the longer we watched the more accepted August was. If there was a real problem Carol would let me know. I was sad to leave that day but knew August was in the right place. Here is the first of Carol’s email updates. Did August make friends? Stay tuned!